Songs. We all know that they have deeper meaning than just the music that makes its way to our ears. The notes, harmonies, melodies, strums of the guitar, beats of the drum, and skills of the artist…mixed with the venue you heard it in…is a concoction for memories. We remember the mood we were in, the people around us, the smells in the air, the clothes we were wearing, the time period, and if we were crying or laughing. Songs imprint themselves on us like pieces of emotional history. I have to say that I remember many years ago when Mumford & Sons first came out with their giant hit and debuted on the scene with The Cave. I remember saying to myself, “This makes me feel pretty good. I like these guys a lot.” The reason I am writing about Mumford & Sons in this post today is for a specific reason. Mumford & Sons new hit I Will Wait, off of their “Babel” album is already a huge sensation. When I first heard this song, I was delivering pizzas in Grand Rapids, Michigan. I was making money to get by, paying bills, paying rent, etc. At this time in my life, I had two degrees in social work and had put myself through 6 years of university and graduate school. At this point I had been planning to move to New Zealand for the past 3 1/2 years and had been working my fingers to the bone, day in, and day out, in order to fulfill my lifelong calling to work with youth in New Zealand. My calling was beginning to look like it wasn’t going to happen, and I really didn’t know what was happening. Things were tense and I was struggling to get a job. I took a degrading job so that I could survive in the meantime, all the while telling myself that it was going to be worth it. Can I tell you how incredibly emotional it was being in the plane overlooking the ground on the day I left for New Zealand? Well, it was. And now that I’m here, fulfilling my dream, I cannot help but thank God, and thank all my family/friends who helped me get here, and stayed with me when I refused to give up on my dreams. You know who you are. On a side note, this song is just really happy, and I’m found renewed with joy whenever I hear it. Enjoy. Today I will be educating you on Carl Jung, Katharine Cook Briggs, and Isabel Briggs Myers. Additionally, their “type-test” will unleash a creepy amount of information about me that I didn’t expect to be so spot on. No, this test isn’t actually psychic. Yes, it is reveals much about yourself. Let’s dive right in. 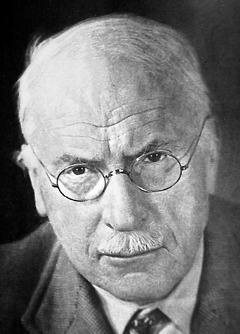 Carl Gustav Jung was a Swiss psychotherapist and psychiatrist. He founded analytical psychology and his typological theories were proposed and first published in his 1921 book Psychological Types. There were four principal psychological functions by which we experience the world: sensation, intuition, feeling, and thinking. One of these four functions is dominant most of the time. 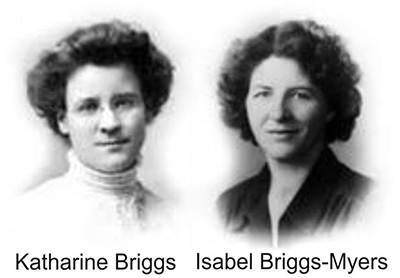 Fast forward fifteen or so years with Katharine Cook Briggs & Isabel Briggs Myers entering the scene. These two women studied extensively the work of Jung, turning their interest of human behavior into a devotion, turning the theory of psychological types to practical use. 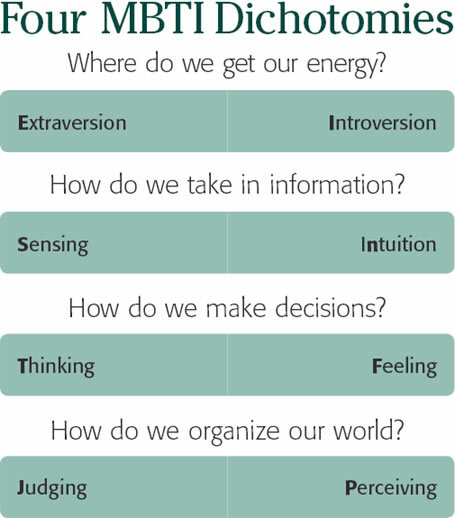 First published in 1962, the Myres-Briggs Type Indicator (MBTI) is the theory of psychological type as originally developed by Carl Jung years ago. Robert Kaplan and Dennis Saccuzzo offer some insight on the MBTI, “the underlying assumption of the MBTI is that we all have specific preferences in the way we construe our experiences, and these preferences underlie our interests, needs, values, and motivation” (p. 499). I recommend that you go to THIS link to read each of the dichotomies for E/I, S/N, T/F. and J/P to judge which 4 letters are attributed to you. You pick either E or I, then move to pick either S or N, and so on. As for this blog post, I will be outlining how freaky my test results were. Personally, I believe myself to be an ISFP, and personally, this is really freaky correct. ISFP are realistic, flexible and observant. They are warm and quietly helpful. ISFP take their energy from the inner world of thoughts and emotions. They prefer dealing with facts and people, making decisions on the basis of their personal values. They are usually tolerant, adaptable, and open minded. They do, however, have very strong values which cannot be crossed. If a value is threatened, the ISFP will become surprisingly vocal. ISFP are quiet, playful, sensitive, and kind. They are interested in people, enjoying their company preferably on an individual basis or in small numbers. They take a caring and practical approach to helping others. They are loyal and faithful to those that they are close to. they often have an affinity with nature, animals and the outdoors. isfp may also be risk takers and enjoy adventurous activities. Isfp have a great ability to accept what is before them and tend to be content. they are not driven and are unlikely to pursue higher education. they have a strong practical side which is often artistic as well. They have extremely well-developed senses, and an aesthetic appreciation for beauty. They are good at making things. isfp like to create harmony around themselves. they enjoy the present and dislike confrontation and conflict. they do not tend to be interested in leading or controlling others and usually act as a very supportive member of a team. All of a sudden, I remember where I was when I wrote this. I was on my bed, and I remember the feeling in my chest now, even as I write this sentence. The feeling was filled with new-found passion and joy. I wrote this 4 years ago, because of something I started to do inside this notebook. I started a project. 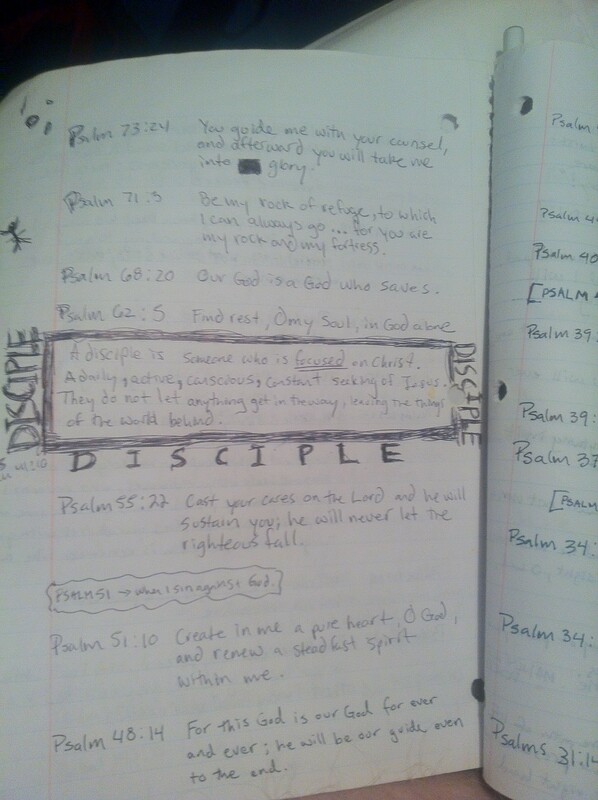 I began to sift through the Bible that I had owned since coming to know Christ when I was 13 (some of you know this as the Duck-tape Bible), and I searched for all the verses I highlighted over the years that spoke specifically to our relationship with God. This was a challenge of sorts because it meant combing through everything I have read, and reading new pieces that I had yet to discover. The process awoke something in me that I didn’t know existed. 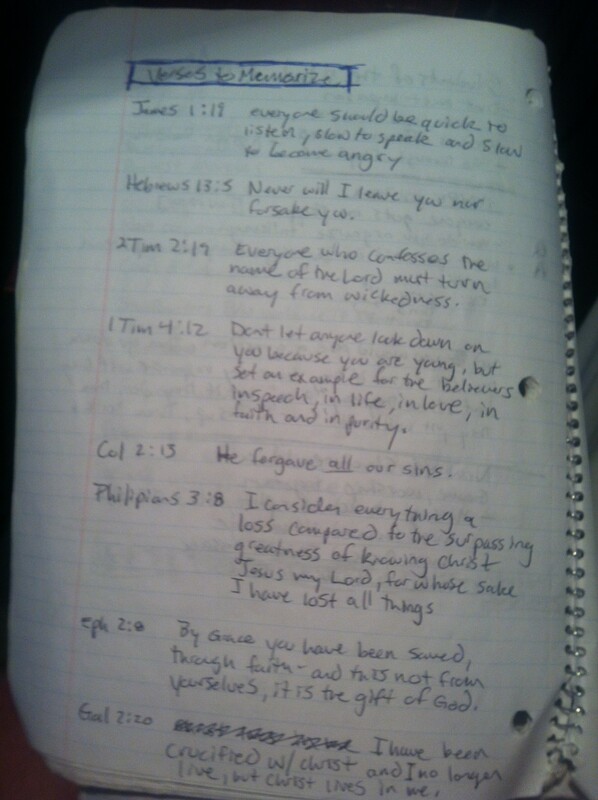 Page after page, I transcribed the verses into my notebook. There was a rush in my heart, I felt SO alive, that I had to document it. 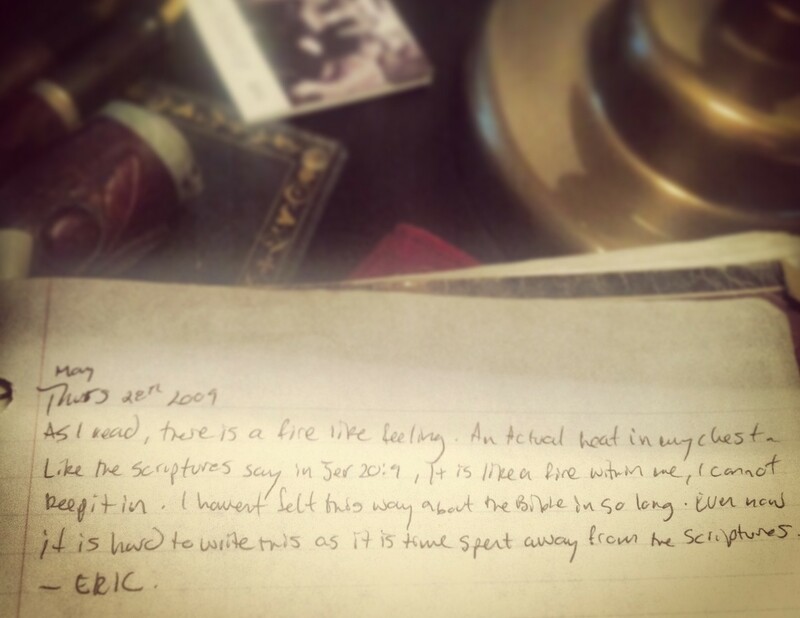 And this is when I wrote the little note in the back of the notebook. This is when I immortalized the deep, living, transformative experience that was going on inside of me at that very moment. The most helpful by-product of this project has been returning to the notebook whenever I need to be lifted up. 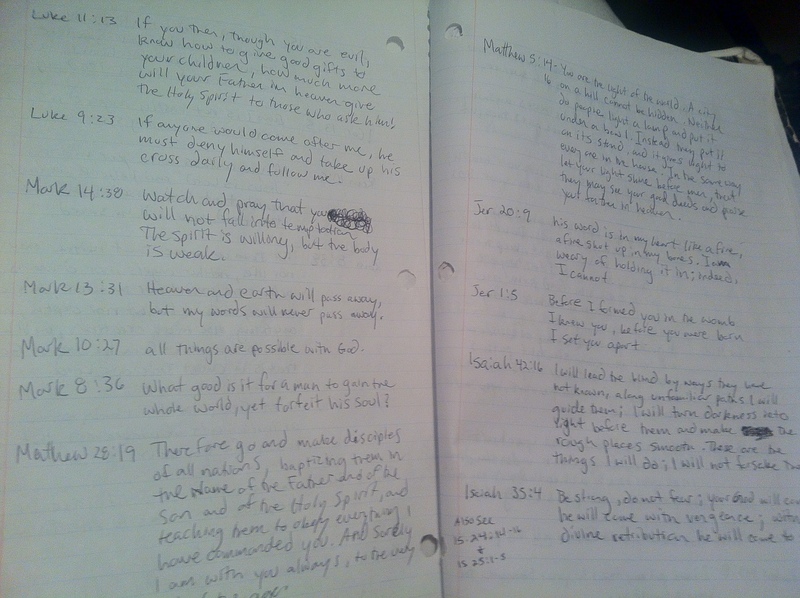 Many times I have felt less than amazing and have opened up this notebook to pour over the truth, and beauty within Christ’s promises for us, and afterward…I feel his peace, and joy, and provision for me. It feels awesome. I have never shared this with anyone in full, but I hope that it can reassure and maybe even give hope to others, and I know there are others, who feel as if there is something missing, or lost. Our fire is never lost, I just think we need reminding once and a while. So thank you 21 year old, past self. You saw the value and wisdom in trying to reach out to an older, future self, that would one day need a proper reminder of how truly amazing it is when we chase Him with all we are.